President Trump's health care executive order is designed to increase competition and choice. But it would also deal a major blow to the health of Obamacare. The president says his action would give millions of Americans more access to affordable coverage. Supporters, such as Republican Senator Rand Paul of Kentucky, say the order will make it easier for people to obtain large group coverage, which is generally considered the best insurance to have. But critics argue it could lure younger, healthier consumers away from Obamacare with cheaper, but skimpier policies, while leaving sicker folks to pay higher premiums on the exchanges. Many industry and consumer groups, including the American Cancer Society and the American Hospital Association, voiced concerns about Trump's move. "Today's executive order will allow health insurance plans that cover fewer benefits and offer fewer consumer protections," Tom Nickels, executive vice president of the hospital group, said in a statement Thursday. "In addition, these provisions could destabilize the individual and small group markets, leaving millions of Americans who need comprehensive coverage to manage chronic and other pre-existing conditions, as well as protection against unforeseen illness and injury, without affordable options." Nothing is likely to happen immediately. It could take months for the administration to craft new regulations and guidance to carry out the order. Let more small businesses join together to buy coverage. Trump is directing the Labor Department to study how to make it easier for small businesses, and possibly individuals, to collectively buy health insurance through association health plans. Small employers may expand their ability to offer group coverage across state lines, providing them with a broader range of policies at lower rates. Association health plans are usually sponsored by trade organizations or interest groups. But the administration could amend the rules governing these plans so they are no longer subject to state regulation, said health policy experts. Instead, the nationwide plans may come under the same federal oversight as large-employer policies. 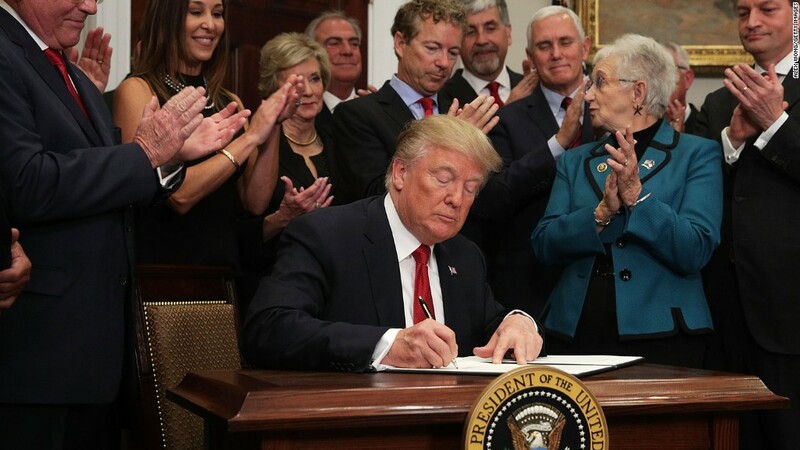 Large group plans, however, do not have to adhere to all of Obamacare's provisions, such as the requirement to provide comprehensive benefits that cover prescription drugs, mental health and substance abuse. The regulatory switch could also allow association plans to deny coverage to the group or set rates based on the medical history of those in the group, so plans with younger, healthier members could offer lower premiums. Employers participating in these plans would not be allowed to exclude employees or develop premiums based on health conditions, the administration said. But the associations could charge certain employers more than others based on their workers' medical histories, experts said. Extend short-term coverage policies. The order would allow more consumers to purchase short-term health insurance plans. It directs agencies to lengthen the coverage of these policies and permit renewals. They were originally designed to insure people for several months while they were between jobs or going through other life transitions. Some plans provided coverage for up to a year. The Obama administration last year limited the duration to 90 days. These plans may have lower rates, but they typically provide less comprehensive coverage. They are not subject to Obamacare's regulations, so they can exclude those with pre-existing conditions or base rates on consumers' health background. This allows them to cherry pick whom to sign up and to offer lower rates to the healthy. Those who have short-term plans now are not considered insured and are subject to the Obamacare penalty. Expand employers' ability to give workers cash to buy coverage elsewhere. Health reimbursement arrangements are not well-known, but they figure into Trump's executive order. Employers use them to provide workers with tax-free funds to pay for health care costs, mainly deductibles and co-pays. Prior to Obamacare, employers used HRAs to reimburse workers for a wider array of expenses, including premiums. The health reform law barred the use of HRAs to buy policies on the individual market. Trump's executive order directs federal agencies to expand the flexibility and use of these employer-funded accounts to give workers more coverage choices. Health care experts expect HRAs will be allowed to pay premiums for individual market policies. President Trump is taking actions to dismantle Obamacare on his own. How do you think this will affect your health care coverage? Email healthcarestories@cnn.com. You could be included in an upcoming CNNMoney article.